Even without using words that give films “R” ratings, just a few condescending syllables can break a man. Don't Judge a word. Judge its intent. Think about your reaction to that four-lettered, single-syllabled synonym for feces. Were you repulsed? Humored? Intrigued? Unfazed? Profanity. Many deem it offensive. But are curse words innately sinful as they relate to the Christian faith? This passage speaks on encouraging others so as to heighten their esteem, to “speak that it may give grace to those who hear.” This is a theme constantly explored in the Bible. Followers of Christ are regularly commanded to edify one another, practice sympathy and love thy neighbor. On the other hand, to act corruptly assumes an active willingness to negatively reduce something to a lesser state. Acting in such a manner toward another human would mean acting dishonorably and degrading either their status or poise. And in many cases, words of spite can tear a man down much faster than words of grace can build him up. But is swearing itself fundamentally wrong? Let’s play devil’s advocate and assume, without fact, that there is an inherent vice in the use of profanity. If this be the case, under the lens Ephesians provides, profane “alternatives” should be considered immoral as well. Darn. Gosh. Shoot. The intention behind these exclamatory remarks parallel the original. If the root holds intrinsic malice, would not its alternative also, simply based on the intention motivating its use? It’s strange, unnatural even, to consider the alternatives as wrong. But it gets us close to an answer — no way can a series of clicks, hushes and vocal vibrations escaping our mouths actually hold intrinsic malevolence. That’s why the intention motivating a word is key. Consider the rationale of a word – is it intended to encourage or corrupt? Look at gossiping, lying, bullying – all perversions of positive character building. Exactly what the Book of Ephesians directs us not to do. Even without using words that give films “R” ratings, just a few condescending syllables can break a man. Words many would deem inappropriate often find themselves in tasteful humor, proper expression of emotion and without intent to debase another person. Yes, some words suggest, by their definition, an intent to hurt. But remember – saying a word aloud is not the same as derogatorily labeling someone. Don’t judge a word. Judge it’s intent. 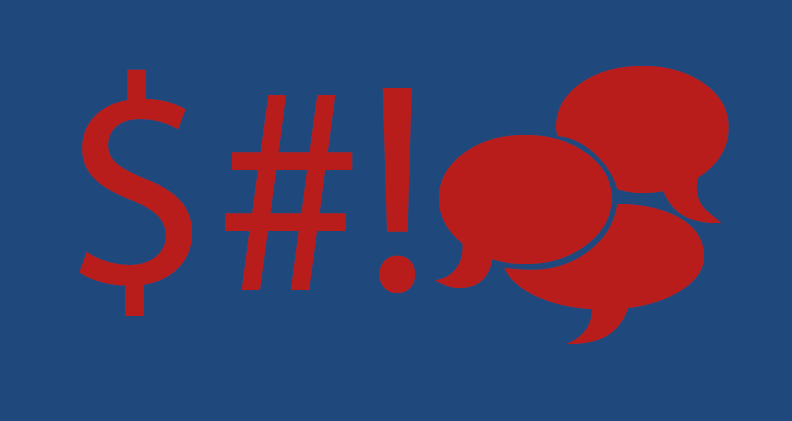 Is swearing the problem, or are you? Read Chelsea Tyler’s opposing view.